Herbicide spraying in some fashion has become common practice on any well maintained farm here on the west coast and it is not taken lightly here at Air-O-Fan. Common to our air-blast sprayer lines, the Herb 500 & 300 gallon have maintained the high quality standards that Air-O-Fan has always stood for. Standard features include 12.5L ribbed implement tires, HD hubs & spindles, 3 port pressure manifold w/regulator, 14 GPM (P-48 Comet) diaphragm pump coupled to a 4 to 1 gear reduction box w/neutral which is chain coupled to our standard 1" mechanical agitation system found on our PTO driven air-blast sprayer models. Herb also uses the same chassis, axle, and spray tank found on our G3 air-blast sprayer line, this commonality in parts helps our growers in the field with any down time that could be lost due to say (for example) a spindle failure. Options for Herb are no different, growers can add a front cover, quick fills, manual, hydraulic, or electric spray control valves, our Ace hydraulic drive centrifugal pump option w/jet agitation, hydraulically driven P-48 pump, different tire configurations, PBM spray boom options, and even our own skirted Eliminator spray boom option. 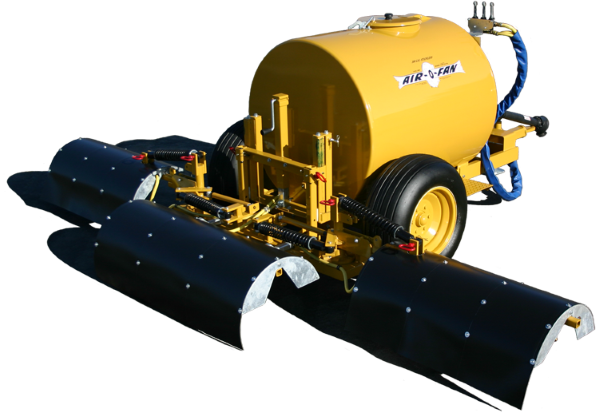 Herb is undoubtedly the best built herbicide sprayer on the market today but with all the bell and whistle he does come at a price, the base unit is an affordable model and can be equipped to spray without to many options. Please give us a call or e-mail us, we would love to answer any questions you may have. Width 500 Gal. = 76"
Height 500 Gal. = 62"
Width 300 Gal. = 68"
Height 300 Gal. = 56"